It’s date night. A couple is getting ready for a dinner out at Longhorn Steakhouse. Deciding each partner needs a special outfit for the evening, they go shopping for clothes. So they pull up to Goodwill. To pick out the tackiest ensembles they could find. For $10. That’s how Noel and Shane Pauley spent their Friday night, according to Noel’s Facebook post, which went viral with over 300,000 reactions, 401,000 shares and 179,000 comments (and growing!) in less than four days. Noel shared on her blog, Baby Bows and Bullets, that her husband came up with the idea for their date night after hearing about another couple who’d done the same. They established some rules: they each only had $10 to shop, they had to wear whatever their partner picked out for them and they couldn’t discuss their zany plan after leaving Goodwill. That led onlookers wondering if they just dressed like that all the time. For his wife, Shane picked out what appears to be a floral two-piece dress with shoulder pads that belonged to someone several generations older than her, while Noel dressed her husband in a mismatched plaid getup. The two spent a collective $13 on the date night gear, significantly less than the allotted $20, according to Noel’s blog post. To add to the fun, the couple picked fake names and had to commit to using their aliases all night. Noel became Ethel, and Shane became Roger. To all the regular Goodwill shoppers who think the Pauleys were throwing shade at the secondhand shopping chain, that isn’t the case. 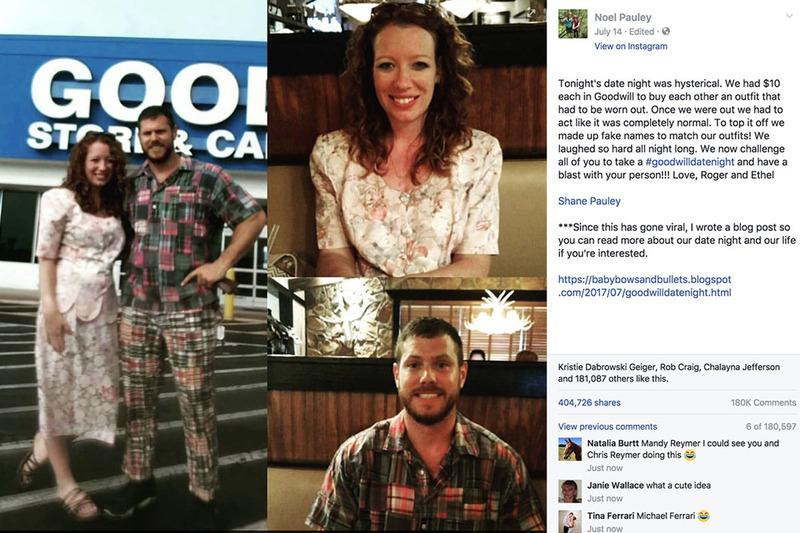 Noel challenged other couples to try the date night idea and post photos of their adventures to social media using the hashtag #goodwilldatenight. While the Pauleys’ low-cost date seems like a hilarious time, there are so many other affordable options out there if getting laughed at all night isn’t your idea of fun. Go geocaching or try another one of these 25 budget-friendly date ideas. Exploring a new neighborhood with your significant other is on this list of 11 cheap date night ideas for parents. For a daytime date, consider going to an arts festival — which is on this list of 10 ideas for a fun, free outing. Dating doesn’t have to cost an arm and a leg. You can enjoy a memorable moment with your sweetheart on any budget.